Adapted from an Agatha Christie murder mystery, Witness for the Prosecution derives special pleasures from performances and star power. Tyrone Power plays accused murderer Leonard Vole with a sense of theatrical grandeur, like a well-rehearsed and polished lie. Power's good looks get a slightly oiled look treatment writer/director Billy Wilder's keen moviemaking eyes. Don't be fooled for what may seem like Power's overacting. He's not. The worn sleeve elegance of Vole is perfect for Power, the handsome movie star just beginning to show some signs of age. The sensational high profile murder trial calls for a high profile defense. Vole turns to Sir Wilfrid Robarts, reputedly one of Britain's best courtroom players. The aging acidly sagacious barrister is just out of hospital with a recommendation to go slow and is under a nurse's supervision. Charles Laughton puffs up Robarts with a delightfully sly and often hilarious performance. Over the top? Well, let's just say Laughton doesn't miss a chance to dance with the language provided by Wilder's script. Elsa Lancaster (Mrs. Laughton) is frightfully silly as the nurse, but the comic elements seem to blend deliciously in Wilder's soup de murder. And talk about bigger than life acting, Marlene Dietrich plays Christine Vole, Leonard's German born wife. Dietrich knows a thing or two about carving up the set scenery and has lots of fun with her role. 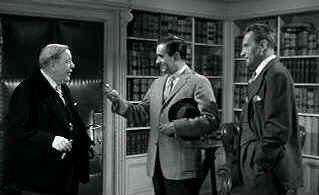 The majority of the action takes place in Sir Wilfrid's office and in court. The pacing, with it's hefty dose of humor, is nimble. Wilder's timing is outstanding. You could call Witness for the Prosecution a court room drama may. There's plenty of cross-examination, witness theatrics, and tart legal objections. It may be somewhat "old-fashioned," but it is thoroughly entertaining. Drink it with the anticipation of a vintage wine. Roll it around in the glass, think about the lineage, sip it thoughtfully. Good source elements for Witness for the Prosecution translate to a cleanly produced DVD image delivered widescreen 1.66 by MGM. Black levels are good and gray scale range retains a nice balanced look. The image is sharp and detailed. It's a pretty brightly lit film and shadow detail isn't very crucial. Straight edge nightmares like the book shelves in Robarts' office are free of twitter. A few scratches and minor dirt markings crop up here and there. The Dolby Digital mono sound is recorded with easily discernible dialogue . Glenn Erickson's insightful DVD reviews have been a Internet fixture for several years. Check out some of his sophisticated feature articles. Currently hosted by DVD Talk. An elegantly presented fan site dedicated to one of Hollywood's great action stars. A huge selection of French movie posters with images galore. Don't miss this site if you ate interested in lovely French posters.